requires Java 8 or later and JavaFX. It is available at:. You can the download this web site for use on your own computer. PDF, e-book, and print versions of the textbook are also available. The PDF that includes links might be the best way to read it on your computer. Links to the downloads can be found at the bottom of this page. http://math.hws.edu/eck/cs124/downloads/javanotes7.zip — This "zip" archive contains a complete copy of the web site. It should be usable on almost any computer. Size: 4.3 Megabytes. http://math.hws.edu/eck/cs124/downloads/javanotes7-example-programs.zip — A zip archive of the "source" directory from the web site, which includes source code for sample programs from the text. Note that if you download the complete web site, then you already have a copy of the same source directory. See the README file. Size: 773 Kilobytes. http://math.hws.edu/eck/cs124/downloads/javanotes7-exercise-solutions.zip — A zip archive containing source code for all the end-of-chapter exercises. These have been extracted from the web pages that contain the solutions as a convenience. They are not included in the web site download. See the README file. Size: 322 Kilobytes. 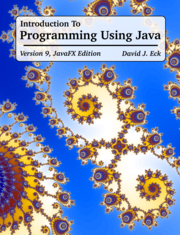 http://math.hws.edu/eck/cs124/downloads/javanotes7-linked.pdf — a PDF version with internal links for navigation and external links to source code files, exercise solutions, and other resources that are not included in the PDF. Recommended for on-screen reading. Size: 6.3 Megabytes; 755 pages. http://math.hws.edu/eck/cs124/downloads/javanotes7.pdf — a PDF version without links, more suitable for printing. This PDF is in the format that is used for the printed version of the text, except that it also includes an appendix listing example programs and a glossary (since they would have exceeded the lulu.com page limit). Size: 5.9 Megabytes; 762 pages. Printed versions — I have made this book available for purchase in printed versions from the print-on-demand publisher lulu.com. This is for convenience only, for those who would like to have a bound printout in a nice form. (Please do not feel obliged to buy the printed version; I do not make any money from it!) The entire book is available in a rather thick printed version at http://www.lulu.com/content/612392. It is also available in two parts as http://www.lulu.com/content/559884 and http://www.lulu.com/content/822314. Note that these printed books are the original Version 7, and they still contain errors that have been fixed in Version 7.0.2. See the on-line news page for a list of substantive errors. Complete Sources — The complete source files that are used to produce both the web site and PDF versions of this book are available for download, but will be useful only to a very limited audience. See the end of the preface for more information and a link.